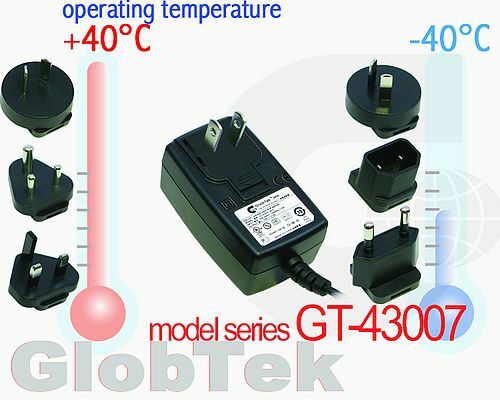 GlobTek announces that it's Wall plug in power supply AC Adapter operating temperature specifications have been tested, certified, and upgraded to -40°C TO +40° C for applications used in extreme climates and conditions, Model series GT-43007. The ITE Information Technology (60950-1) universal input switching power supply is available in Class II, 2 Prong, interchangeable blade configurations. The changeable input blade system has individual field replaceable input plugs for North America/Japan, Europe, United Kingdom, Australia and New Zealand, China, Korea, Argentina, India, Brazil, and also an IEC320 type configuration. The power supply has an input from 90-264VAC 50-60Hz and a factory configurable output of 5VDC to 48VDC output with a max power of 40W continuous output. This product complies with North American Energy Star, Canadian NRCAN, and other worldwide requirements for Level V efficiency compliance and is produced in an ISO9001, ISO13485, and ISO14001 certified facility.